Fill out our simple form and get quotes from local chair cover suppliers. Chair covers will aesthetically transform your venue, giving a much needed lift to drab seat after drab seat. With your personal choice of design and colour, you can be sure that chair covers will be just the finishing touch your event needs. Add to Event helps you find a wide selection of event planners in your area. Get a quote today to find out how our event planners can help with your event. Let us know your requirements and we'll tailor a package for you, no matter the colour or sache! I have table and chairs to hire and can include stretch cover and sashes etc. White and black chair covers available. Sashes available in a variety of colours and materials. Who doesn't need chairs? Cover them or style them or hire them. We can help with everything chairs. Arc Front White Spandex Chair Covers that will turn those plain old chairs into an elegant affair. Classy and yet economical, our wedding chair cover hire are exactly what you're looking for. We're a family run company which provides close cover white chair covers, we only supply high quality covers, all freshly laundered and folded ready for your chair. 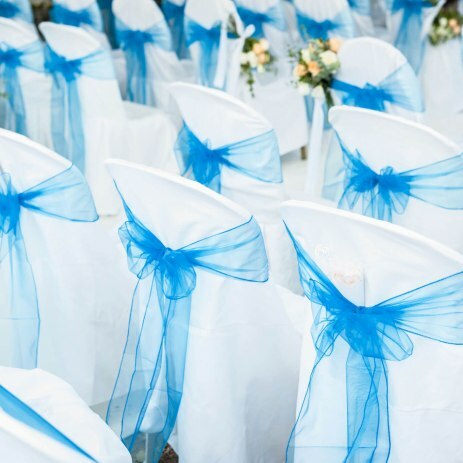 We can provide you with Lycra Chair Covers and Sashes in an array of colours and materials to suite any event.